Today I attended the Bloggers’ Row event hosted by Belle Badgley Mischka at the Dillard’s Fayette Mall location. 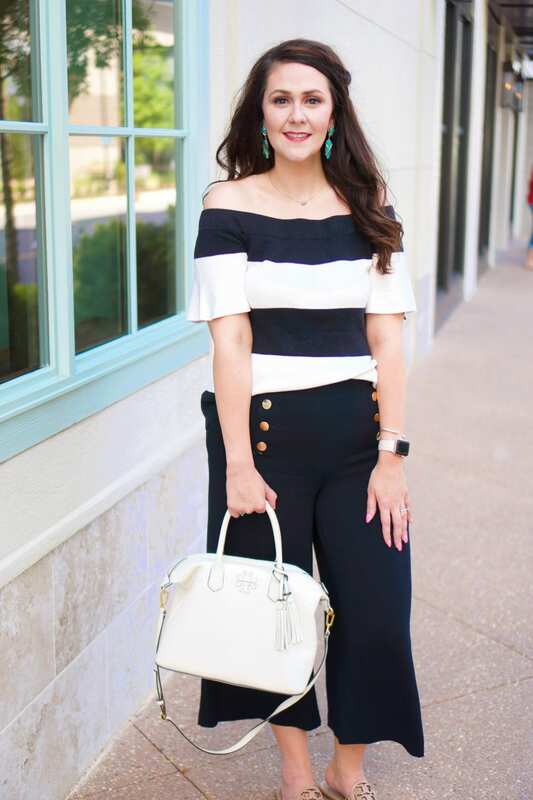 It was a fun networking event with other local fashion bloggers that featured mock mint juleps (surprisingly delicious), blogging conversation, and a stylish Derby-wear selection. I came away from the event with some new ideas and new blogging buddies. Courtney from Rage Luvr, and Jess from Teeny Avocado. Being from Kentucky, I love the fashion surrounding the Derby. 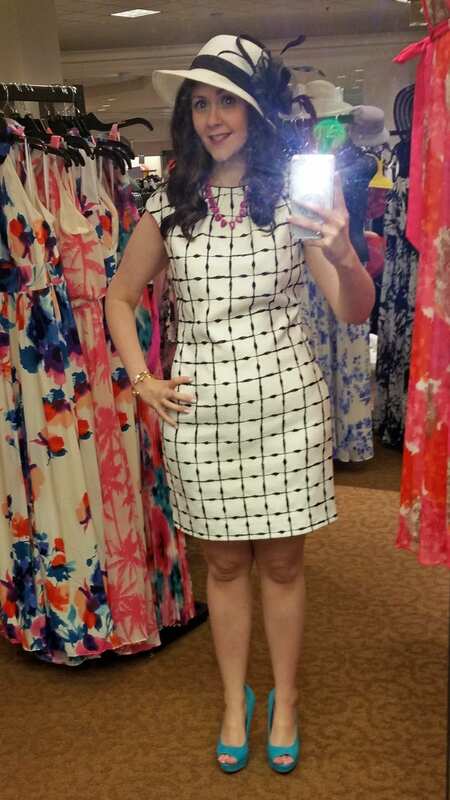 Dillard’s has been my go-to for formal fashion since my 1st law school prom/Barristers Ball (yes, that’s a thing). I find their selection to usually be of great quality but also reasonably priced, especially when they’re having a sale, like this weekend! While I’ll be attending a party on Derby Day and won’t get to experience the race firsthand, here’s some outfits I would totally rock for Derby!!! Black and white is a timeless color combination. You can make the classy colors very springy by adding in pops of color. 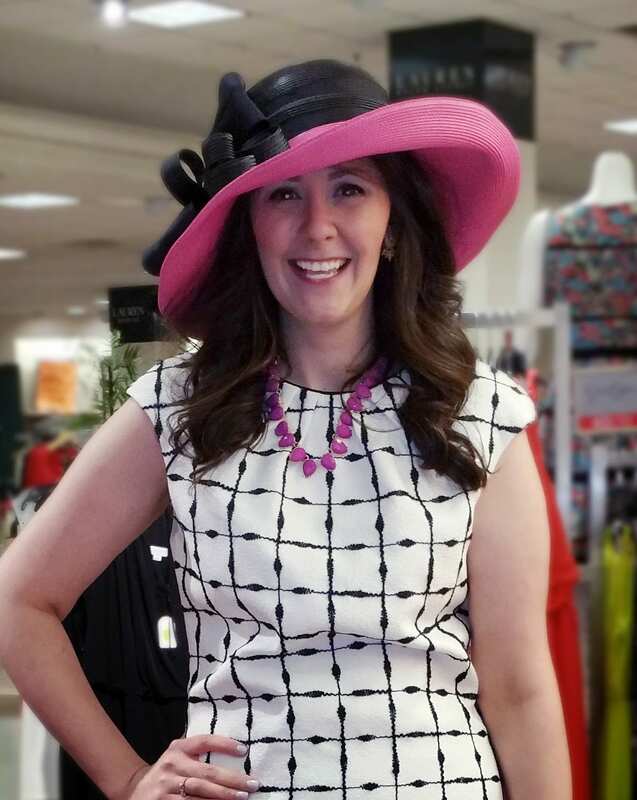 Here, I accented the dress with a black and pink Derby hat, pink necklace, and pink shoes. The dress is more of a fitted sheath dress, and while cap sleeves are usually a no-no for me, these worked perfectly! I also picked up this black + white hat on the way back to the dressing room and I like it just as well as the pink + black hat. Changing up the hat and shoes really gives the dress a different feel. Since the entire outfit is mostly black and white, I added pops of 2 different colors to give the outfit a more fun vibe! 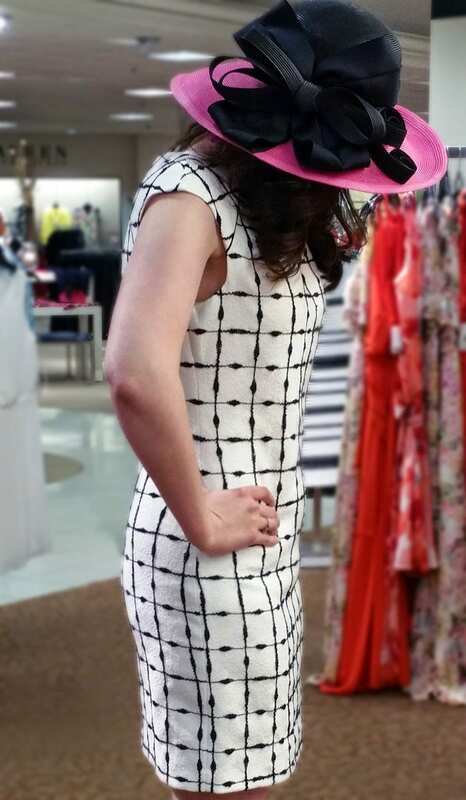 Ladies, I just don’t think you can go wrong with pink for Derby! Periwinkle and bright pink is probably my other favorite color combination, and the pink accents really help the periwinkle to shine and make a statement. This dress was very stretchy and comfortable. I also really liked the sleeve length. 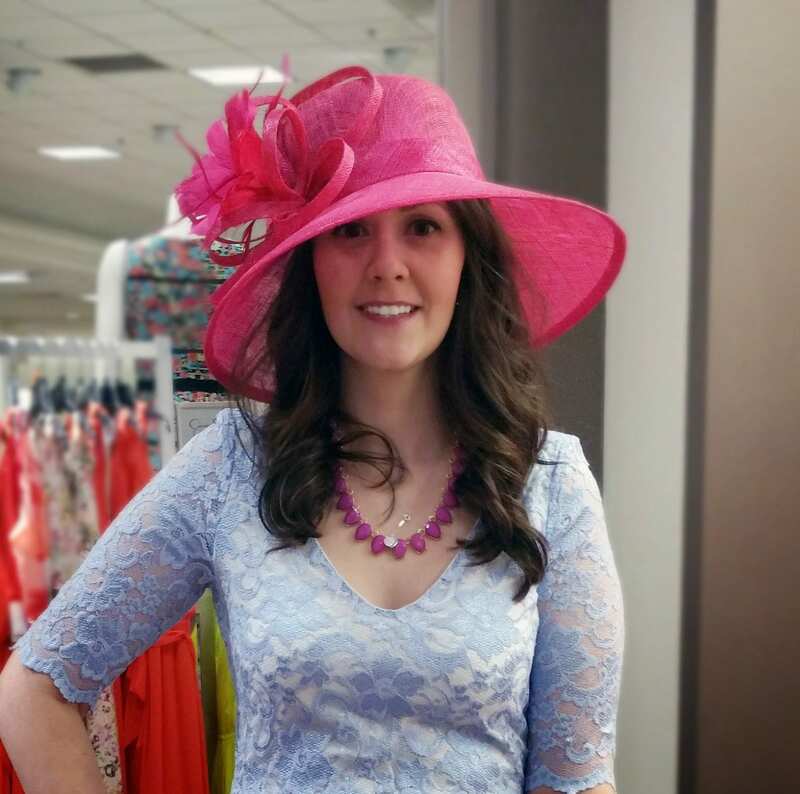 I felt very Princess Kate in this dress–I should have tried a fascinator on with it!!! The pink shoes are the same for both outfits. One of the fabulous ladies at Dillard’s had actually already purchased these shoes and had them in her office. She and her co-worker insisted that these were a must to go with either hat, and I truly agree with them. Aren’t they fabulous?! You may notice that both pairs of heels I’m wearing are the same style–open-toe pumps with a solid heel. I find it much easier to walk in this style of heels easier to walk in and more comfortable when I know I’m going to have to walk alot. I would like to say thank you to Dillard’s and Badgley Mischka for inviting me to this event. 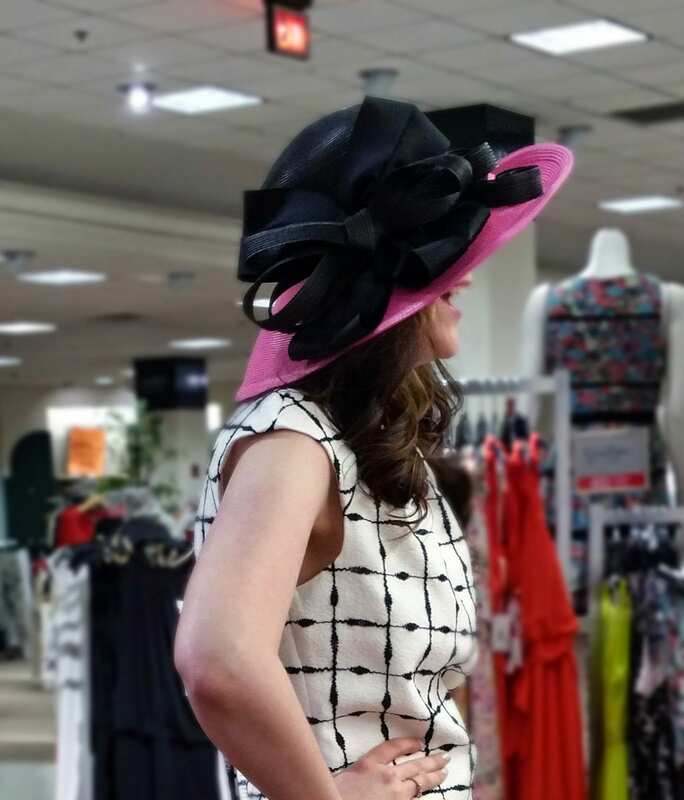 The staff at Dillard’s were a joy to chat with and they played photographers for my dress up session–thanks, ladies!!! NOTE: I was not asked to blog about the event or share anything on social media. I truly just had a wonderful time and fell in love with these outfits, so I wanted to share the experience with you all. I didn’t make any purchase because I’ve put myself on a spending freeze, but I would happily buy everything I tried on In a heartbeat!